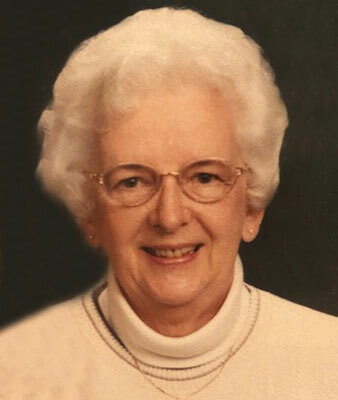 YOUNGSTOWN - Private services were held Tuesday for Audrey Martin, 87, who died peacefully Tuesday night at Windsor House in Canfield. Audrey was born March 3, 1931, in Youngstown, the daughter of Samuel and Eva (Carter) Black. She was a devoted and loving wife and mother to her husband and her children. Audrey was a member of the Old North Church and the Meander Long Golf League. She enjoy bowling and most of all, spending time with her grandchildren. Audrey’s husband, Lloyd R. Martin, whom she married Jan. 1, 1948, died Jan. 14, 2016. Audrey is survived by a daughter, Joyce M. Martin of Austintown; two sons, Robert L. (Barbara) Martin of Murfreesboro, Tenn., and John E. (Nancy) Martin of Youngstown; grandchildren Bryon (Elizabeth) Martin, Lisa (John) Dietrich, John E. (Becky) Martin Jr., Richard L. (Sammie) Martin Jr. and Jennifer (Jason) Fautas, Josh (Becky) Warnock, Jennifer (Rob) Rothermel and Brian (Rachel) Warnock; great-grandchildren Emma Jean Wayne, Bryce Martin, Carly Martin, Preslee Lynn Martin, and Matthew Wince; and daughter-in-law Mary Martin of Austintown. She was preceded in death by her parents; a son, Richard Martin; and sister Vivian Alexander. The family would like to thank the staff at Hospice House and the Windsor House in Canfield for their care and compassion during Audrey’s final days.